So the fact that she even acknowledged the building beyond something that was cluttering the end table is a red letter day. But the fact that she picked it up, took a look and then praised it could mean the world is about to end. I tell this story so you will appreciate that when I say this cottage is a stunning piece of scenery, it’s not hyperbole, it’s not me blowing smoke up Tabletop World’s arse – that’s not how we roll at The Shell Case anyway – it’s because it is genuinely, hand on heart, fantastic. When it arrived I was struck at how pristine the casting was, plus the lack of residue, flash or that funky smell that often follows resin around from the release agent. It was, for want of a better word; perfect. And the sculpting equally isn’t far off. The attention to detail is staggering, the organic feel of the stone is superb and the fact that you can see the roofing tacks holding the tiles in place is just mad. But more than that, it feels like a run down home. It has the detritus of habitation but it’s not exaggerated, it doesn’t shout. It isn’t covered in skulls… It does have a bucket though. And the best thing about those signs of wear and tear is that they can all be mended. The attention to detail continues into the inside of the house – yes you can lift the rood off – as the floorboards are rough and uneven and the plaster cracked or coming away from the wall in some places. It really is really quite gorgeous. Combine it with a few other bits of a detritus and an out house and you’ve got yourself a handsome piece for any fantasy game. The rub is that it’ll set you back around £30. When you consider that the Dreadstone Blight from the Games Workshop is only £20 you’d be forgiven for asking why you’d part with your hard-earned cash. And the reason is simple. 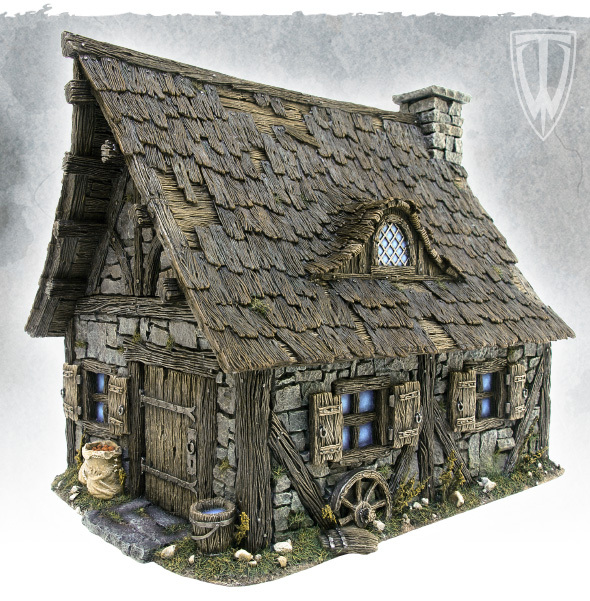 It is as close to a perfect example of a 28mm fantasy/medieval house that I’ve ever seen. It is a marvel of design and creation. It isn’t the biggest house or the most versatile, but that’s okay. Buy cheaper more robust scenery to be clambered all over. The Tabletop World cottage is something to be admired. Place it on a board and it will tell a tale whether it’s on the edge of a ruined district of Mordheim or next to a river. I love this piece because of its beautiful simplicity and because I know how hard it must have been to achieve for the person charged with its creation. I love its design and look. I love the obvious care that was taken to cast it. It really is stunning. And that’s without paint. Check out more of Tabletop World’s range here. Really pretty terrain piece, very nice.